This is a great choice for a hoedown! A western murder mystery full of can can girls & cowboy words & phrases! This is set in the Wild West. Richard Woods – a wealthy landowner – was shot down while riding to town. Lots of people wanted him dead. But which one did it? Yesterday in Mitchido Richard Woods – a wealthy landowner – was shot down in cold blood whilst he was riding to town. He leaves behind his wife Katherine and daughter Annabel. There is a gathering of his family and the townsfolk to discuss what should be done. The people at the meeting look uneasy. They are not sure who will be arrested as the murderer and they are afraid that the gunslingers that are present might take the law into their own hands if they don't like the verdict. Annabel Woods: "Daddy found out that I'd kissed a boy at school. He told me I couldn't ride my horse Black Beauty for a whole month. I cried and cried until my tear tank was dry." "Murder on the Prairie" is fun for a very loud group, or that's what we had. The group added songs from Annie Oakley movies. They had a heap of fun. I decorated the room like a saloon." "Hi Stephanie: After reading the newsletter I thought I'd send you a message about our Murder on the Prairie party. We planned the party to celebrate my 40th birthday. We had decorations that looked like a saloon and a country store. Everyone came dressed in costume and really got into their parts even more than I expected. I handed out pads at the start of the party so that everyone could make notes about the characters. I read the pads at the end of the evening when everyone was gone and the notes were so serious that it was funny. People made inferences with no basis just because they were so intent on solving the mystery. At the end we had gag gifts for all the guests such as handcuffs for the murderer, lifesavers for the life of the party, magnifying glass for the best detective and a jigsaw puzzle for the person who solved the "puzzle". We had alot of fun and it was a great way to celebrate. Thanks, Cindy Evoy"
"Stephanie you are the best! So far this one's the best!!! Maybe it was because of the group, who added so much more to the murder! Eddie and Luke were best friends and Luke should have won the Oscar for Best Actor. LuLu was certainly a peach! Flashing leg everywhere. Everyone developed southern or farming drawls and the ad-lib was outrageous by everyone. We are definitely proud of this Murder Mystery! If you ever need a referral, you send them my way! They would hear rave reviews from us! Lori Venturini Munro House Bed & Breakfast Jonesville, Michigan, USA"
"We had a wonderful time at the party. I had friends and co-workers there who didn't even know each other, and they all interacted wonderfully as part of the mystery. I had the mix and mingle kit, and it was so much fun. One of the ladies (who played Margaret Read) said it was the most fun she had had in YEARS! Everyone here at work wants to know if we're going to make it an annual event (I did this for my 30th birthday party). Everyone was excited when we came back to work on Monday. They were all on your website looking for mysteries they could host on their own! 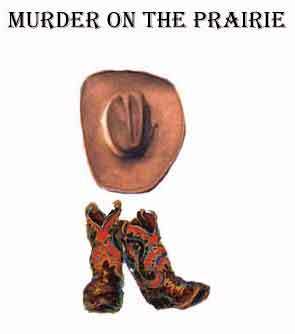 Thanks, Karen Tinsley"
"Murder on the Prairie was a hoot! I wanted to invite all of my teacher friends so the male parts were played by females. It was a riot! Everyone brought a Wild West dish to share and we had food galore! I turned my house into the “Salty Lick Saloon” complete with old liquor bottles filled with colored water to look authentic! We did the introductions and act one upstairs in the saloon and went downstairs for the dinner and act 2. The final act was done outside on my deck overlooking the woods. I even had old time oil lanterns lighting the deck because we were still goin’ strong long after dark! Thanks again for a knock down, drag out, knee slappin’ good time! "A group at our church gets together annually for a get-away and this year we decided to try Merri Mysteries "Murder on the Prairie". We all had so much fun; even adults enjoy the chance to dress up in costumes and role-play once in a while. We appreciated that we didn't have to worry about questionable or risque roles or scripts. We gave everyone three weeks to prepare for their roles, and even the anticipation of seeing what everyone would do was fun. I especially like that you have lots of roles - even those who are not suspects had some direction on how to dress up. Thanks for offering this service." We're from Poland. Mystery Games aren't popular here and we found out about it by chance from a teacher who teaches educational games. This was the first time we've ever played Mystery Game. We send you our group photo and couple of our impressions. We decided to order "Murder on the Prairie" scenario. A month before the party took place we sent to our guests invitations in a form of a newspaper which looked like a western one. There were main facts about the party, guests, the suspects and some extra clues and information to mislead our guests. They also received short description of their characters so they had enough time to prepare and find appropriate clothes. The party took place in New Year's Eve. Unfortunately, we've really harsh winters in Poland so some of our guests became sick two days before the party. Fortunately, other people were eager to take their place instead although they didn't have their costumes prepared. Every person wore a ID card with their character's name so that everyone knew who was who. We made some western decorations suggesting that the investigations was taking place in saloon in the middle of the city. We had most-wanted posters, wooden toilet, signposts to ranchos etc. We added some extra games such as darts, gunslingers duels and eating super spicy cowboy bean. We prepared special thematic food which we served between the acts. The party was so addictive that we almost missed midnight's fireworks. At the end all the suspects wanted to be guilty and they were very sad that they were not. Before we announced who was the murderer guests could type their suspects. The winners won tin of corn. When we showed our friends photos from the party their regretted that they weren't there. We hope to play more Mystery Games in the future and make it more popular here. Aleksandra Pazda Topolska and friends." "I am sending along some pictures we took of our first Murder Mystery party. Everyone had a ball, even the ones I had to promise my first born and drag kicking and screaming to the event! The next time I do this I will make sure we spend more time on the picture taking. Some of these costumes were really great, especially the lady with the bonnet, and I don't think we did them justice in the pictures. She (Margaret Read) embellished the theme by bringing along a rather large basket completely covered with a little blanket. The contents of this basket remained closely guarded until she dramatically revealed the contents. The secret love child of Spring Leaf and ???? that she was raising for our Indian Maid!! The child, a Indian papoose doll, was named Squash Bottom right after Margaret had to change her first diaper! For those who have never done this, it was the first party I have ever thrown and I really enjoyed every minute of it. The package gives you enough to get your creative juices flowing and it's off to the races from there!" "We had an excellent time acting out our characters. One of the highlights of the night was how Spring Leaf was played by a man (instead of a woman)... watching her relationships transpire as the story developed was a riot! This being our first Murder Mystery Party, I would definitely try another one based on our experiences. Thanks!!" "My name is Catherine Bentler, I purchased the Murder on the Prairie party for our gourmet dinner group. Every other month for the past 3 years, this group has had a gourmet dinner get-together. When we were to host in January this year, we decided we needed to mix things up. Since we live in Montana, I thought the Murder on the Prairie Western Theme suited this group the best. We transformed our front room into a Saloon, made our back family room into a huge dining hall with checked table cloths and beer mugs. The costumes were fabulous. Some people even rented them from a local Theatre company. Even our babysitter dressed in prairie clothes and helped with the serving. Her kind mother also lent us loads of western décor from their own home! We made “Wanted” posters with participants’ faces. Dried Cranberry and Apple Crisp with Ice Cream"
See photo no. 6 above of the squaw and the widow. "Thanks so much for the mystery Murder on the Prairie. What a blast. We had 20 people in total. The way that I picked the characters was great. I put all the names into a box and drew one name at a time, and the first name was the first character, all the way down the till all characters were taken. I couldn't have done a better casting call myself. I took pieces of rawhide and cut them into circles and wrote each name on them, and tied them with string, so they could either wear them on their shirts or around their wrists. (So everyone knew who was who) For food I served a fondue, with Buffalo, Elk, Moose, Beef, Chicken, Goose & Shrimp, plus all the vegies. Towards the end of the evening, everyone was right into their character. The Barber (Joe) asked if anyone would give $300 to have Dr. Reyes' beard shaved. (I have never seen my husband without a beard). Next thing you know, there was $300 put into Lulu's garter. So into total we raised over $700 from a murder mystery party with only 20 people in attendance. We had a $100 cash for whoever guessed who the murderer was. We had 3 people guess correctly. The winners actually donated the money back to the club. So they only real expense was for the food. And most of the food was donated. Everyone wants to know when the next one is going to be. Plus we have another 20 or so people that want to come to the next one. Please let me know if you can help!! See photos no. 7, 8 and 9 above. My parents moved to the country. I was annoyed, because I preferred the city where I could go to the opera. The people in Mitchido bored me. They were so uncultured. Joe was the only one who seemed to read. We used to discuss Shakespeare together when we talked after Church on Sundays. When I turned 17, the men came courting me. I liked Joe the best, but my parents said his parents were poor and that he would not be able to provide very well for me. Richard also came a courting. He seemed rougher than a rodeo rider's chaps, but my parents insisted that I marry him. I hated him, but there was no way to escape him. He decided that I was never to leave the ranch for any reason and so I have been kept here like a bear in a trap. He wouldn't even allow ladies to visit me in case they might mention their husbands. His jealousy knew no bounds. I wasn't even allowed to go to Church. When I was little, I remember hearing Mummy crying. The next morning she looked sad. I guessed Mummy and Daddy had argued because they weren't talking to each other at all. When I asked Daddy why he'd been mean to Mummy, he said that it was because Mummy didn't love him. When I was growing up Daddy and I spent quite a lot of time together. I was his helping hand. He taught me how to ride and shoot and he called me his little tomboy. Spring Leaf and I also spent time together when I was young. She taught me all sorts of Indian secrets. One time, Spring Leaf and I exchanged blood and swore to be blood sisters for the rest of our lives. I told Daddy and he was very angry with me and with Spring Leaf. When I turned 12, Daddy tried to get me to give up wearing pants. He said it was time I acted like a little lady. I refused but he insisted. After that, I avoided spending time with Daddy. I wore a skirt but I continued to act as if I didn't. Richard and I went to school together. He was one of the school bullies and used to beat me up all the time when I was younger. Later, when I had grown up to be taller than him and learned how to box, he stopped beating me up. But the resentment was still there. My father was the town Sheriff and he was grooming me to take over from him. Richard's father was doing the same. He was a landowner. Richard's father and my father were great friends, so we had to be civil to one another. It wasn't till I was about to take over from my Dad, that I realized why he had been great friends with Richard's Dad. It was because Richard's Dad always gave him a supplement to his Sheriff's wages. I protested to my Dad that it was unethical, but he said it was the tradition and that if I wasn't courteous enough to accept Richard's Dad's generosity, then he wouldn't recommend me to become Sheriff when he retired. When I was at school, Richard teased me and said I was the son of the red and white pole - meaning I was the barber's son. Richard always picked on my weakest points. He knew I was proud of my perfect hair, so he got some other boys to hold me down and then he cut large chunks out of my haircut. I had to wear a hat. My father refused to say anything about it to Richard's father, because he was hoping I would win a scholarship and Richard's father was the main contributor to the school scholarships. Although I had been groomed to be a barber from an early age, I still dreamed of another type of life. My books were my escape. My mother said it was a shame I couldn't be a librarian. I knew I would never be allowed to marry Katherine, but it didn't stop me from loving her. When I was growing up, Richard was in the same year as me. He was always attacking the younger boys. When I married Nancy, I was the happiest man alive. We had a big celebration. I even invited Katherine and Richard. They had been married about a year by then and Katherine was very pregnant with Annabel. Richard came and left his pregnant wife at home to fend for herself. A year after our marriage, Nancy died giving birth to our son. He died too. I was devastated. I could never think of re-marrying - my memories of Nancy are so strong, I could never forget her. Annabel loved to ride. She looked like a princess on her pony and she took to visiting me even though she knew her Dad and I were feuding because he dammed up a river, rendering a fifth of my property useless. My parents worked for a family who were very cruel and made them work 7 days a week. They were Richard's parents. When I was 4, my father died. He was only 45. When I was 5, my mother died of a sickness. They put me in the orphanage in town till I was 9 and old enough to work. In the orphanage, I became friends with Luke. We were great buddies and they were fun times in my life. The Nuns in the orphanage were strict but kind. Ever since the orphanage, I have been a devoted Christian. And God has been kind to me. He sent me to work for Mr Frank and he is a good boss. He lets me have Sundays off so I can go to Church. Being black, I only get to stand at the back of the Church, but I'm just happy to be there. Mr Frank lets me ride in the back of the sulky, so I don't even have to walk to Church. I'm very lucky to work for him. My parents were wealthy, but they were killed by Indians when they were coming by wagon to settle the land. I grew up as an orphan in Mitchido. And Eddie was my friend. The Nuns gave me an education. After I finished school, I found work with Mr Woods as a farm hand. I worked hard for him and I enjoyed the work with the cattle. Mr Woods taught me how to ride like a bronco buster and to shoot like a bounty hunter. I felt sorry for Mrs Woods because she was never allowed to leave the ranch or even to speak with us farm workers. Last year Mr Woods sacked me because I had romantic intentions towards his daughter Annabel. Now I work for Frank and he treats me like a son. My parents were killed when I was little by Crow Indians, but I was lucky because one of the Indians liked my red hair and took me back with him. They called me "Red As The Sun". My hair's not as red now though. The Indians taught me how to ride bare-back and hands free. I learnt how to shoot a gun going full gallop. But when I became a man, they said I had to leave because I wasn't one of them. Then I worked as a stockman for a while, but word got around about how good I was with a gun. Being brought up Indian, I haven't been held back by all these Christian ethics. If a man is bad, I have no hesitation in killing him. People pay me to kill for them. The money is good and I can hide well because of my Indian training, so the law never catches up with me. Frank Reyes has brought me to town because he wants someone on his side to help with a showdown. I dreamed of being an opera singer, but my mother was too poor to send me to singing lessons. My father abandoned us when I was little. I suppose that's why I have never really trusted men much. After I turned 12, I went to work in a factory. When I turned 17, someone offered me a job as a Can-Can girl. I thought it sounded more fun so I did it. After I had been with the show about a month, they said that they had been offered a permanent spot in Mitchido in the country. Being young, I thought that sounded exciting. The sponsors of the show get a front row seat. Richard was my sponsor and I was his filly - as he liked to call me - for over a year. He felt that gave him the right to tell me what I should perform and how I should live my life. Someday I would prefer to be a singer in a larger town. When I grew up - the boy in the next tepee - "Red As The Sun" - was my friend. When the boy became a man, he was told to leave. I was very sad. My parents said it had to be because he was not the same as us. Then the whites decided they wanted our land and they came and killed us. Their leader was General Woods and he killed my parents. He would have killed me too, but he decided to take me back as his maid. I was only 10 and very distressed, because my parents and friends had been killed. I did not talk for over 2 years. I was made to do chores. After I turned 12, I became the maid of General Woods' son Richard. His wife Katherine was nice to me, but Mr Woods treated me very badly. I went to school with Richard and Katherine, but I wasn't friends with them. I was very good with numbers at school, but because I was a woman, I couldn't become an accountant. My husband and I met at school and a few years after we left school, he stuttered out a proposal of marriage. I knew he wasn't much of a man, but I loved him anyway. We found we couldn't have children so there wasn't much for me to do except to help my husband manage the store. My husband is a bit timid and if anyone starts to question the price of the goods, he just panics - a bit like a horse when it stands on a rattler. They rear and buck and lose the plot completely. But if I'm around, if there's any trouble about money, I just pull out my gun. That stops most people quibbling over a few oats.